My next turned-over card revealed the Metropolitan Borough of Camberwell, previously home to the Liberty of Peckham and the Hamlet of Dulwich, now the southern half of the borough of Southwark. 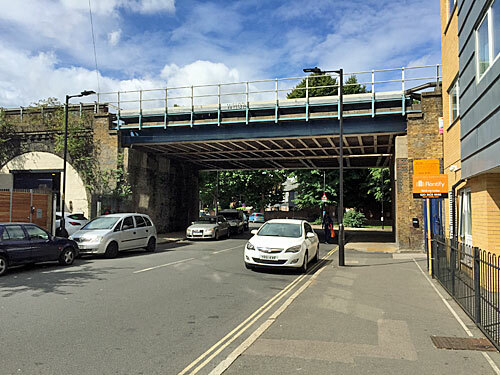 Camberwell remains not as well connected as it could be, so I've been off to visit a) places where old stations used to be b) the bit of Camberwell that's over a mile from any station c) places where new stations might be built. In a notoriously stationless suburb, it must be galling that there's still a street called Camberwell Station Road. The ex-station (on the line south from Blackfriars) opened in 1862, but swiftly succumbed to competition from electric trams at the start of the 20th century, and closed to passenger traffic in 1916. Freight continued to use a small goods yard on the northern side, but this too was closed and the station's been completely out of action since 1964. No platforms survive, but the booking office is still in use as a garage... or at least I think it is, it's hard to tell on a Saturday when the front is shuttered. Here's proper carelessness, a second consecutive station closed in 1916 and never reopened. Walworth Road station lay just off the street of the same name, on a viaduct spanning four residential streets, and was a full four platform affair. Those surrounding terraces have since been comprehensively redeveloped, the Station Tavern replaced by flats and the street pattern radically changed, with Beresford Street (where the entrance was) now known as John Ruskin Street. Zone 2's railway black hole lies at the eastern end of Burgess Park - the only part of inner London to be over a mile away from a station. My blog explored this phenomenon in some detail a couple of years ago with the aid of a special map, you may remember. There were once houses here where the park now stands, either side of the Grand Surrey Canal, but bomb damage and demolition carved out a new greenspace for Southwark in the 1970s. Alongside grew the monolithic slab blocks of the Aylesbury Estate, about as far removed from their Metroland namesakes as it's possible to imagine, a couple of which also nudge into the 1-mile void. But you might be coming eventually. 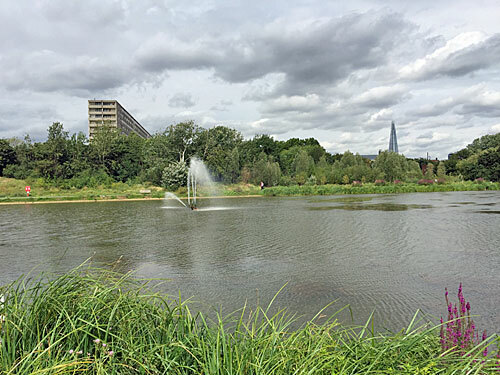 Plans to extend the Bakerloo line to Lewisham are progressing slowly, and one of the two brand new stations is pencilled in for the northeast tip of Burgess Park. Not actually in the park itself, you'll be pleased to hear, but on the opposite side of the busy Old Kent Road, in one of two potential locations. 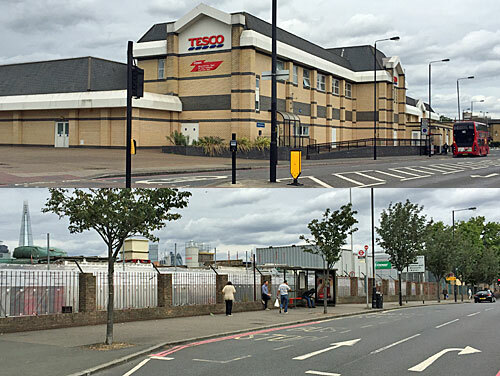 A recent consultation offered up either the big Tesco and its car park, or a light industrial compound the other side of Dunton Road, for the station currently codenamed Old Kent Road 1. And last week the results of that consultation were published, with a fairly convincing (2:1) public preference for supermarket demolition. 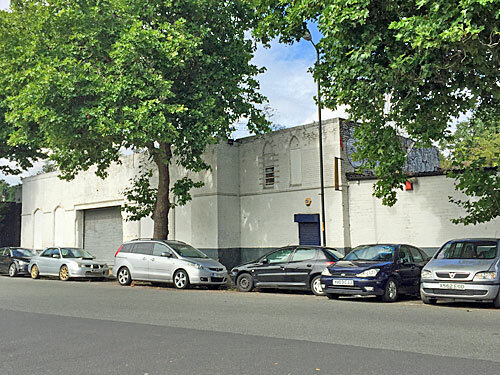 The location of the second potential Old Kent Road station is more of a headscratcher. Again there are two possible locations but this time almost half a mile apart rather than nearly on top of each other. 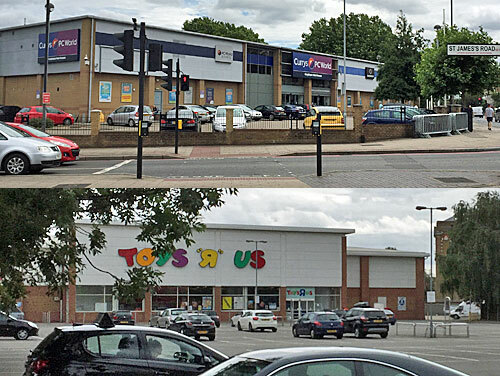 Option A would be on the corner of St James's Road, opposite B&Q, with the station replacing Currys, PC World and B&M. This site is well placed for interchange with local bus services, and also close to a trading estate developers have a mind to turn into flats. On the downside it'd be relatively close to Old Kent Road station 1 - I walked it in comfortably under 15 minutes - which might be the site's downfall. When you're planning to open two new stations in an area that hasn't got any, it's a bit silly to build them too close together.